For more than one-hundred years, Tracy, California, served as one of the major centers of rail transportation in the western United States. Beginning in the 1860s, transcontinental passenger and freight trains heading to and from the San Francisco Bay Area passed through busy Tulare Township on the San Joaquin Valley’s west side, where Tracy (originally Tracy Junction) would take root in 1878. According to Southern Pacific records, Tracy’s freight yard set records for traffic handled through its connections with Oakland, San Jose and San Francisco (via Niles Canyon), Martinez (via the Mococo Line that parallels the Byron Highway), Los Banos (via the Westside Branch) and Stockton, Fresno and Sacramento (via the Lathrop branch), and on to Los Angeles, Portland, Ogden and points east. Into the early 1970s, passenger trains — including the San Joaquin Daylight and the overnight Owl in the pre-Amtrak era — made daily stops at the Southern Pacific’s busy Tracy depot, while the legendary California Zephyr streamliner passed through town on its route to and from Chicago on tracks that now carry the daily ACE commuter trains. Sugar beets, tomatoes, asparagus, dry beans and other produce were loaded on trains in Tracy, and the city once boasted one of the largest petroleum storage facilities on the West Coast, which also served as a fueling station for oil-fired steam locomotives. The designation and development of the “Bowtie” area (in the vacant former railyards near the new Tracy Transit Station at Sixth and Central) as the Downtown Tracy Railroad Historical District, along with the creation of the San Joaquin Valley Railroad Museum, affords the opportunity to attract countless railroad enthusiasts of all ages to the city for a variety of activities throughout the year, and would serve as a vital cog in the revitalization of the downtown area. 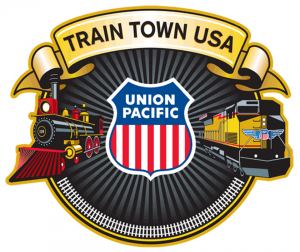 In 2014, through the combined efforts of the City of Tracy, the Tracy City Center Association (TCCA), the Tracy Chamber of Commerce, the Tracy Historical Museum and the Railtown Tracy Project team, the city received its official designation as Train Town USA from the Union Pacific Railroad, as part of the company’s program to recognize points along its routes that contributed to its growth and development over the past 150 years. 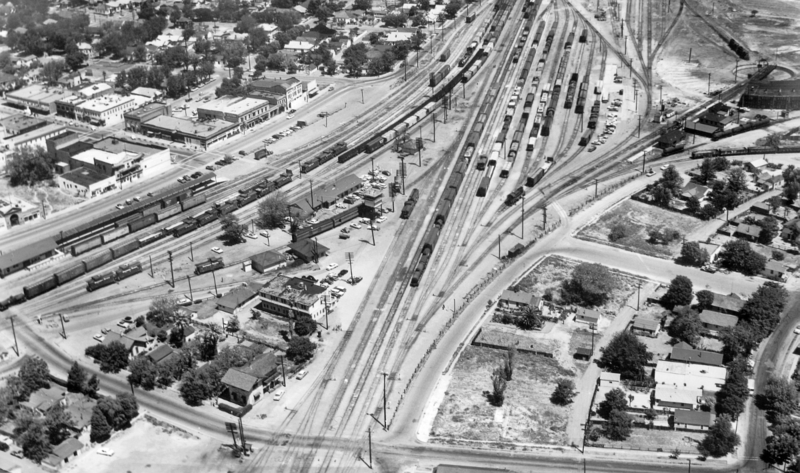 ABOVE: An aerial view of Downtown Tracy in the 1950s. Central Avenue bisects the photo from top left to center right. Special thanks to Frank Maffei for his generous permission to publish his classic photograph of the January 1958 railfan trip to Tracy at the top of this page. 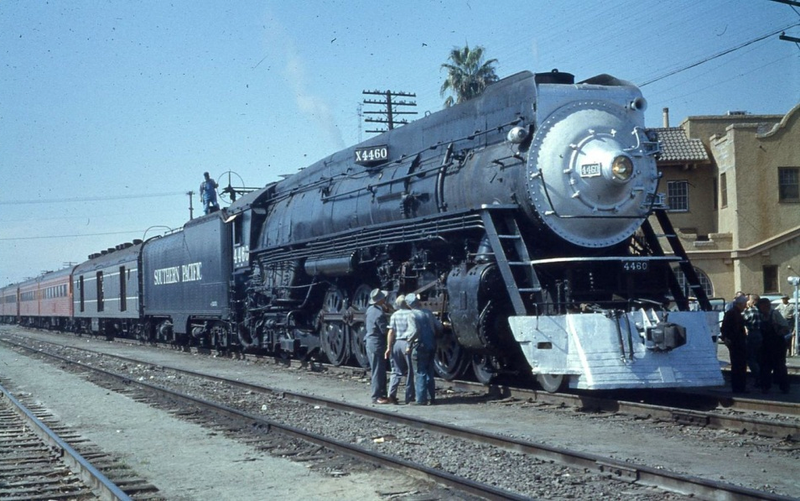 Southern Pacific locomotive 4460 is resting alongside the old SP Clubhouse (partially visible at right) where railroad crews could relax between shifts. If you stood across Central Avenue from the current Tracy Transit Center and faced down the tracks toward the hills, you would have this same view — minus the train and the Clubhouse, of course.